Gymnastics Kansas City | Best Gymnastics Programs in KC Metro! Gymnastics is an excellent sport to improve balance, coordination, strength and flexibility. It teaches self-discipline and total body awareness that will carry over to numerous aspects of your child’s life. We offer gymnastics for youths of all ages, both recreational and competitive. 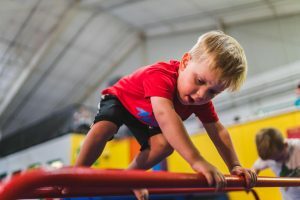 Our competitive program has Men’s USAG levels 4-10, Women’s USAG level’s 3-10, XCEL levels silver, gold and platinum, and our recreational program starts with classes at age 2 (parent-tot) or age 3 (without your parents). Experience our Gymnastic Programs first hand and learn why Emerald City Gym a premier choice for boys and girls gymnastics in Kansas City. Fill out the form below to request a free trial class. Fill out this form to set up your FREE trial class! LEARN WHAT TO EXPECT AT YOUR FREE TRIAL CLASS AT EMERALD CITY! EL ENTRENADOR CÉSAR LE PROPORCIONA MÁS INFORMACIÓN SOBRE EMERALD CITY! Log in to access your gymnastics account (pay tuition, start/stop/switch classes). Your username will be the email address we have on file. First time users: you will need to make sure Emerald City has your current email address. Sign up for Gymnastics Class Today!